I have been a kind of Maestro of Mayhem at the Peninsula Jewish Community Center (PJCC) in Foster City, CA. for the last six months. I was invited in to this nearly 70-year old Jewish Community Center in northern California for one year to be a disruptive force – to challenge assumptions; question practices; and create some discomfort – all in service of cultivating curiosity and courageous creativity as we find our way forward at a time of uncertainty. Like other Jewish legacy institutions across the nation, we are in a process of deep consideration about how to honor and express our Jewish heritage while maintaining relevance in an ever changing, diverse and complex society. I treasure this assignment because it gives me an opportunity to see from the inside what can hold legacy institutions in place; the practices, beliefs, fears and commitments that can stand between the present and a promising future. I treasure this assignment because it matters to me deeply whether our Jewish communal institutions in general, and JCC’s in particular, survive and even more importantly, whether they produce the great social value that is needed to help heal this very broken world. I love THIS particular place because somewhere on the order of 70% of our 10,000 membership roster define themselves as ‘other than Jewish; many come from places ‘other than the United States’ and speak languages in addition to English. All of these people – from all different perspectives, religious beliefs, experiences and identities, are standing with us – in a tent we have been able to create precisely because of who we are – because of our Jewish history, our values, our obligations. As I walk the halls of our magnificent Center and see the great and colorful mosaic that is OUR community, I sense our Jewish self in how we treat those who come to us; in what we offer by way of education, culture, conversation and caring. I know our Jewishness by how we show up and what inspires our efforts. I know we are made better by and because of the encounters we foster; the opportunities we enable to share ourselves with others and to have others share with us. We can be a bridge for understanding and sharing between the Jewish community and the broader community – a home for one and, also, a home for all. This is unique to Jewish Community Centers because we are not institutions of belief; we are institutions of belonging. Our challenge is existential – to retain our roots AND extend our reach. Legacy institutions must affirmatively confront the need to reconcile our past with our futures – first by defining our future and then by mapping a path to get there. Sometimes I think we are afraid to define ourselves in Jewish terms because we think that by definition we limit our value; I believe it is by self-knowledge that we are able to truly add value to the whole world. Judaism is a boundless and evolving civilization that has fixed and fluid elements, subject to the influence of those who identify as part of it (stand with it). Some of us are ready to refashion Judaism to find new ways to connect to it; in our refashioning we are also preserving. JCCs are both an agent and a member of Jewish civilization. We are platforms that hold elements of Jewish civilization – not all but some. Our challenge is to continue to shift the elements we hold to respond to the nature and needs of those we serve. In the end, my sense is that to sustain ourselves is to embrace the evolution – to understand that our institutions will only endure if we manifest our lineage and our deepest identity not by who we serve but by why we serve all we do. 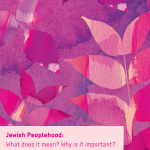 PreviousPrevious post:The Future of the Nation State of the Jewish People: Consolidation or Rupture?NextNext post:Can Peoplehood Consciousness Narrow the Gap Between Israel and American Jewry?